Women of the Wall tiny Torah: Use magnifying glass to celebrate Bat Mitzvah. Women of the Wall with their tiny Torah. Let me tell you a story; it may sound familiar. In it, Jews are forced to come up with sneaky ways to practice their religion in secret. Excited to celebrate the age on which one accepts the Jewish commandments as an adult—the age of mitzvah—a young adult has prepared to read from the Torah. A group assembles and they joyously march to the holiest place of worship they know, but the people praying there stop them from entering with the Torah they’ve brought. They are not discouraged! They have a back-up plan: a 200-year-old miniature scroll lent to them by a London family. They march in with the tiny Torah, hidden away. To read it, the young adult uses a magnifying glass. And thus with cleverness and subterfuge, despite the difficulty and discouragement from the people attempting to stop the event, the young adult enters adulthood. This isn’t some tale from Nazi-era Europe. This happened this morning, Oct. 24, 2014, in Jerusalem. The Jews hoping to celebrate? They were women. And the people trying to stop them? Other Jews. On any given day on the men’s side you’ll hear boisterous public services and song. On ordinary days, on the women’s side—in keeping with the Orthodox prohibition on hearing women’s voices raised in song—you can hear women praying softly by themselves and to themselves. But once a month on rosh hodesh, the celebration of the new Jewish month, the Women of the Wall show up to do their thing. That’s what they are asking for: an hour a month. The New York Times, in their coverage of what they are calling the first “full” bat mitzvah at the Western Wall, makes a similar comparison—noting the differences between the men’s side, where ”rowdy bar mitzvah ceremonies for boys are common,” and the women’s side, where they’re forbidden. (In traditional services, men and women sit separately during prayers.) I’ve been to the Western Wall more times than I can count, and let’s put it this way: I have never been there when a bar mitzvah—a celebration for a boy—was not taking place. 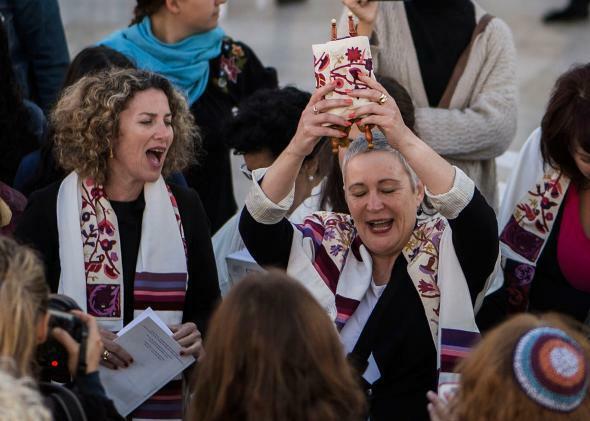 After the 2013 arrests of some of these women, again, for praying and reading from the Torah, the Jerusalem magistrates’ court ruled that they were not disturbing public order—which, the Times reports, “effectively overturned a 2003 Israeli Supreme Court ruling barring practices that might offend more traditional worshipers at the site.” Yet the rabbis who control the Western Wall continue to prohibit these women from entering with a Torah or using one of the many that are kept on the men’s side. The police, on the other hand, were not as interested. The Times ends their coverage of this hilarious and unnecessary tale with a dose of reality. Micky Rosenfeld, a spokesman for the police, said the security forces were more focused Friday on preventing unrest in the Aksa mosque compound and in some predominantly Palestinian areas of East Jerusalem, where tensions are running high. Some scattered disturbances were reported. In other words, the police are busy with more important things. The people policing these women should be, too. I have to ask, again: How long will educated, committed women want to be a part of a community that doesn’t want them?